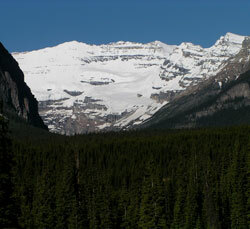 A long, high, ice covered ridge, Mount Victoria is located on the Continental Divide to the east of Cataract Brook and Lake O'Hara. The south summit is the highest point. 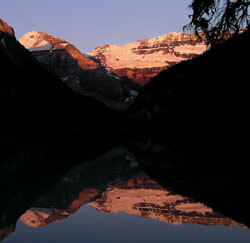 Mount Victoria is most recognized as the back drop for the classic view of Lake Louise. 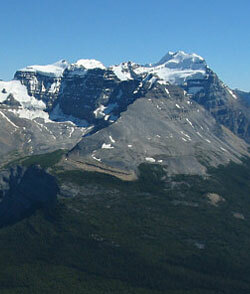 Please note that Victoria Peak is a prominent mountain located southwest of Pincher Creek in southern Alberta.
. 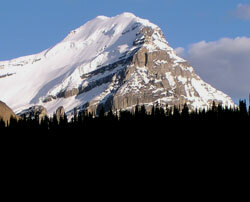 The mountain had previously been known as Mount Green after Rev. William Spotswood Green, a member of the British Alpine Club who visited the Rockies and the Selkirks in 1888. 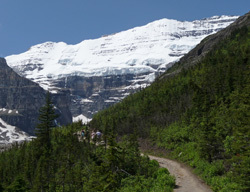 Green's book "Among the Selkirk Glaciers," aroused much interest in the "Canadian Alps" and Green's visit is said to have marked the birth of mountaineering in Canada. 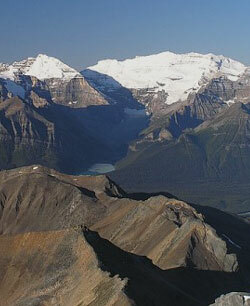 The naming history of nearby Mount Lefroy is a complex one and involves Mount Victoria. 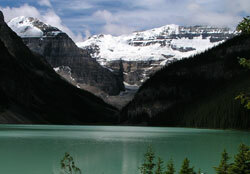 When Green visited Lake Louise in 1888, he was of the opinion that what is now known as Mount Victoria was named Mount Lefroy. 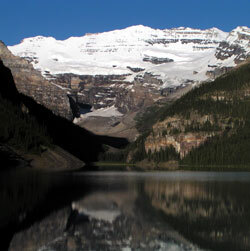 In his book, "Among the Selkirk Glaciers," he wrote, "At the head of the lake the great precipice of Mount Lefroy stood up in noble grandeur, a glacier sweeping round its foot came right down to the head of the lake." The caption of an accompanying drawing leaves no doubt that Green was referring to what is now known as Mount Victoria. Boles et al in "Place Names of the Canadian Rockies" state that the name Mount Victoria was given to the mountain by J.J. McArthur in 1886 (This was McArthur's first year working in the Bow Valley); Karamitsanis in, "Place Names of Alberta" writes that it was named by James McArthur in 1897; and E.J. 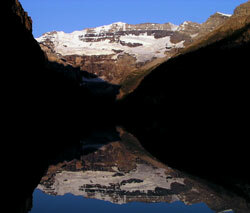 Hart in, "The Place of Bows" states that it was named by Norman Collie's first ascent party in 1897. 1897 seems to make sense for the date given the fact that the peak was known as Mount Green after 1888. Collie's party climbed the mountain in 1897. McArthur was not active in the area in 1897. Although Mount Temple is shown on George Dawson's 1886 map he did not place a name at the location of today's Mount Victoria. 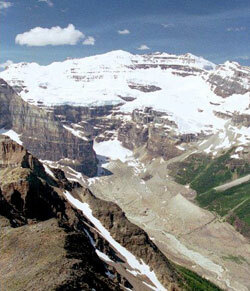 The glacier in this narrow valley flows down a steep slope from Abbot Pass which has an elevation of 2922 metres. An alpine hut, constructed primarily of stone, was built on the pass during the 1920í¢ä‰åä‹¢s by the Swiss Guides to provide a safe base for ascents of Mount Victoria and Mount Lefroy. 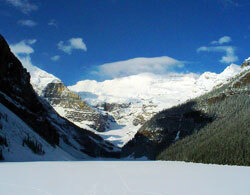 It has been designated as a National Historic Site and is now operated by the Alpine Club of Canada. 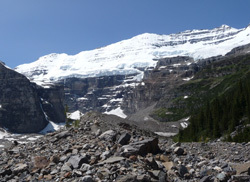 The hut was formerly accessed from Lake Louise but the glacier has deteriorated over the past few decades and most parties now reach the hut from the British Columbia side. 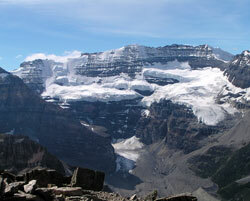 Both Mount Lefroy and Mount Victoria were first climbed in 1897 by parties which included the first alpine guide to climb in the Canadian Rockies, Peter Sarbach of St. Niklaus, Switzerland. 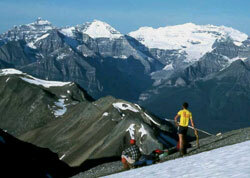 In the case of Mount Victoria, however, Norman Collie led the climb.